The SIP-T48G, designed for executive use, has a large 7 inch color touch screen providing plenty of real estate for paperless phone management functions and 3PCC applications. Gigabit LAN connectivity and Bluetooth earphones are also supported. 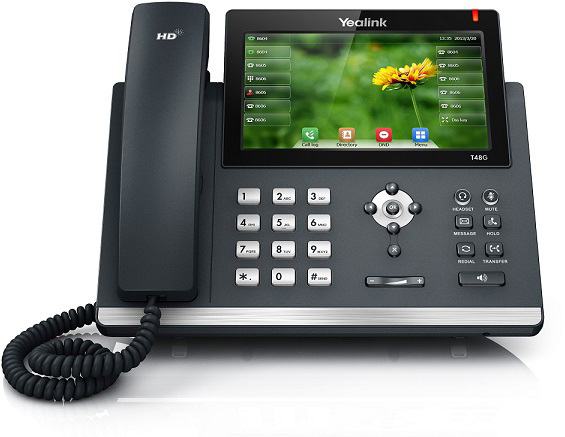 Yealink’s SIP-T48G is the flagship model of the companies T4 IP Phone Series. This 6 SIP Line phone features a large 800×480 pixel backlit Touch Screen color display that makes switching between different screens and applications quick and convenient. Yealink’s Optima HD technology utilizes premium grade audio componentry and the G.722 high definition voice codec for crystal clear telephone calls. The T48G has dual Gigabit Ethernet LAN ports and facilitates rapid call handling, with no network bottlenecks. A Bluetooth USB port enables support for Bluetooth earphones, with wired and wireless Headsets also supported. Perhaps most importantly, the SIP-T48G is designed for paperless operation, with the display screen supporting multi-screen use and 29 one-touch programmable DSS keys. The new IP Phone supports impressive productivity-enhancing features too which make it the natural and obvious efficiency tool for today’s busy executives and professionals.